The Crescent Nebula (NGC 6888, Caldwell 27) is a very bright object along the spine of the cross in Cygnus about 5,000 light years distant with an apparent magnitude of 7.4. It is approximately 18′ x 12′ in size. Its interesting structure arises from a peculiar type of star, referred to as a Wolf-Rayet Star, that generates extremely fast stellar winds that collides with and energizes the slower moving stellar wind previously ejected during the red giant phase. This star for the Crescent is WR 136 (HD 192163) and researchers believe that it reached the red giant phase 400,000 years ago. The result of the collision is a shell and two shock waves, one moving outward and the other moving inward. The inward moving shock wave heats the stellar wind to temperature sufficient to emit X-Rays. This is a good example of what the high contrast of narrowband filters can do to show structure in an object. RGB images of the Crescent show an open, skeletal structure, whereas narrowband images show almost a solid shell. 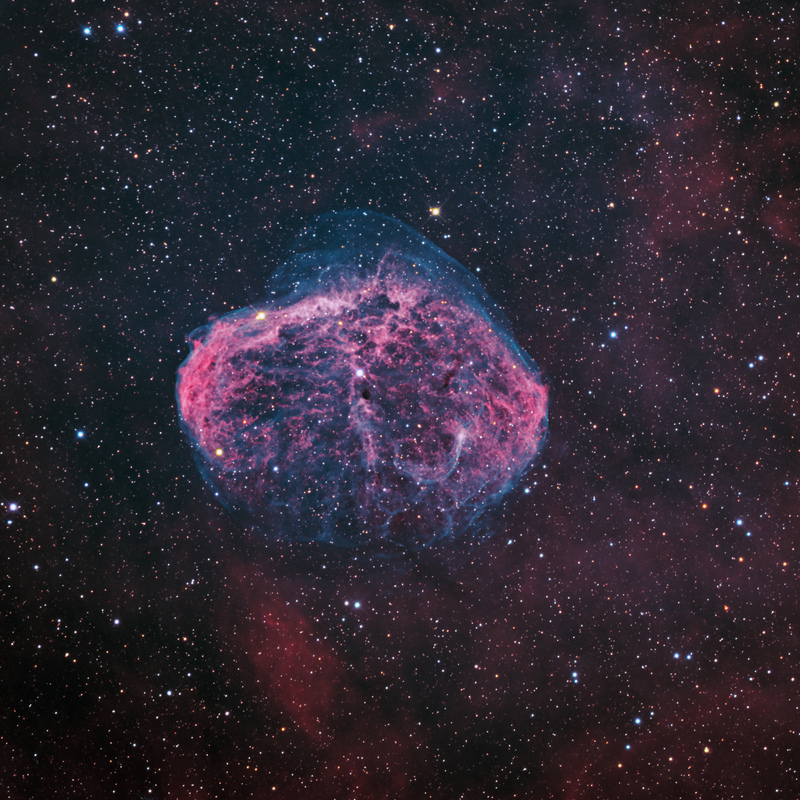 This image was taken with 3 nm H-a and OIII Astrodon narrowband filters mapped to red/magenta (to account for some H-beta) and blue~green, respectively. RGB data were added for star colors.